Meet Jacksonville Florida Congresswoman Corrine Brown (D) – Charged with 22 Counts of Fraud – Facing 350 years – Trial Starts Monday, Where’s the MSM? I am covering this because it seems the MSM doesn’t see a story here. Her trial on 22 counts of fraud will start this Monday April 24, 2019 in the Federal Court House here in Jacksonville, Florida. 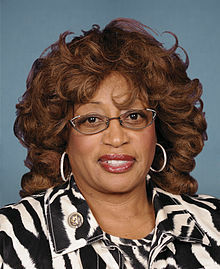 Corrine Brown has been “representing” the district I live in here in Jacksonville Florida, first as a Member of the Florida House of Representatives from the 17th district November 6, 1984 – November 3, 1992, then as a Member of the U.S. House of Representatives from Florida‘s 5th district from January 3, 1993 – January 3, 2017. Even though she has been involved in scandal after scandal she has always gotten away with her shenanigans because she is a black woman Democrat in a mostly black district. Maxine Waters doesn’t hold a candle to Corrine Brown. And I can prove that with this posting and videos.